I love to cook. I love spending time in the kitchen. I love surrending all of my senses to food. Okay...nothing new, right? But sometimes...sometimes....I need a break. We all do. Don't get me wrong, Mexi is pretty rockin' in the kitchen, too...but there's times when neither of us feels like it. So, in lieu of starving or expensive take-out, I dust off a slow-cooker. Or two. I'll be honest with you, though. I don't normally pour over slow-cooker cookbooks the way I do "regular" cookbooks. I mean, I own two. And those are stuck in a sea of hundreds of others. Literally. That all changed when I added number three to the tide. 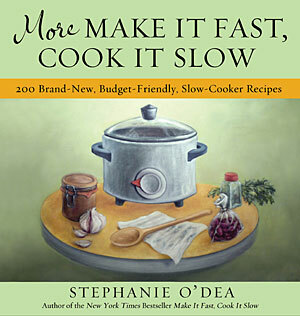 More Make it Fast, Cook it Slow by Stephanie O'Dea is different. I actually found myself bookmarking pages. Lots and lots of pages! This book has over 200 recipes- all of which are gluten-free, by the way (if you follow her notes). Something I love about this book is that it is divided into three sections: $7 and Under, $10 and Under, & $15 and Under. Seriously. Meals that feed anywhere from four to twelve people...require very minimal effort...and taste delicious. I'm totally crushin' on this book and my slow-cooker right now. I don't think I'm cheating on my love for cooking by breaking out my slow-cooker every now and again...especially not now that I have so many things I want to use it for! I've tried four different things to date...all of which we really enjoyed...and have many more meals to share with you in the future, but I couldn't wait any longer to share what I've found so far with you. I'm going to start with my absolute favorite thing I've made from the book so far. I love it so much that I want to marry it. But that would make me a bigamist, and I'm not down with that. Peperoncini Beef Sandwiches were in the $10 and Under section...and they may be the easiest thing on the face of the earth to make. I'm not going to share all of the recipes in the book with you...but I am going to share this one. 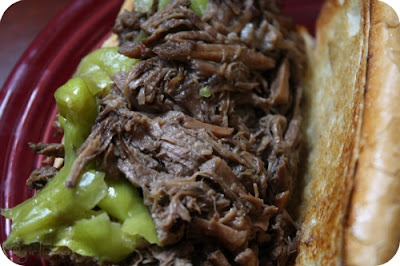 It serves ~6...Place 2 pounds of beef chuck roast in a 4 qt slow cooker. Pour 1 (16 oz) jar of peperoncini peppers over it. Cover and cook on low for 8-10 hours. Uh yeah. That's it! When you remove the lid from the slow-cooker...the smell that assaults your senses makes you want to bury your face in the resulting beef and shake your head back and forth. Would it not ruin the beautiful work your slow-cooker did over the course of the day. Or your skin. Seriously, stick in a fork and move it around and the meat just shreds apart. Chuck has long been one of my favorite cuts of beef...it shreds so nicely. I piled it on a toasted bun and it was love at first bite. O'Dea suggests serving it with sliced mozzarella or swiss...I think provolone would rock it, too...but it doesn't need it. And that's big words coming from a cheeseslut like me. In a second slow-cooker...that's right, I had some simultaneous slow-cooker action going on that day...I had some Creamy Ranch Mashed Red Potatoes going. These were in the $7 and Under section and served ~6, as well. As expected, they were awesome. We love potatoes. We love ranch. We love not having to do anything except hitting them with an immersion blender just before serving. And by we, I mean me. O'Dea also throws in a great recipe for Homemade Ranch Dip Mix at the end of the recipe. Awesome. No MSG! Also in the $7 and Under section and serving 6 was this Lemon Pudding Cake. I was a bit apprehensive about how it would turn out, but I was pleasantly surprised by the results. It set up nicely after letting it sit for a while. The top was more custardy than cakey...and the bottom was very pudding-like. The lemon flavor shown through beautifully, as well. It's not going to win any beauty pageants any time soon, but it definitely gets my vote for Miss Congeniality. I'm not sure I'd make it very often, but I'm glad I tried it. 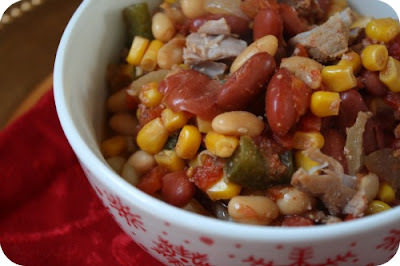 The last thing I made...which scented the whole house magically for hours and made our bellies scream in anticipation...was "Real" Pork and Beans. Not anything like you imagine when you think pork and beans...but absolutely tasty! I thought it was basically like a southwest-style chili. It fell in the $15 and Under section...mainly because it uses pork tenderloin as the meat...but that's still a pretty inexpensive meal for 6 in my book. I actually made it into a meal for at least 8 by cooking up some elbow macaroni on the side and tossing it together for a chili mac that I developed a must-satisfy craving for while it was cooking. Totally. Awesome. I have everything ready to make O'Dea's version of Hoppin' John this New Year's...black-eyed peas, smoked sausage, collard greens...oh yeah. I'll be updating you on how it was after we've tried it. (*Update: 1/1/11...click on the name Hoppin' John above to see my results. Mmmmm.) Also on my to-try list from More Make it Fast, Cook it Slow ...go figure...two different version of my obsession TORTILLA SOUP. So, take it easy on yourself every once in a while...break out the slow-cooker. And check out a copy of this book for some fantastic ideas! *I received a copy of this book free for review from the publisher, but the thoughts expressed in this post are all my own. I am for sure picking up a copy of this! I have the other one and love it! Great review, thanks! Sounds like you've been having fun with your crock! You know I'm getting this!!! I use my slow cooker every Sunday during the winter months. Heather, thank you so much for this wonderful review! I'm SO glad you enjoyed the book, and am SO happy to have inspired you to use your slow cooker more often! have an absolutely wonderful New Year, and thank you for making my day today. great review! I have seen this book lately and have been tempted. Everything you made looks delicious. Loving that beef recipe especially. That does sound like a great book to have (do I need another bookcase if I get it???). I made that pepperocini beef for a potluck last year and they almost licked the pot clean! This book sounds interesting, I do use my slow cooker specially for roasts and that beef recipe sounds to good to be true, so I will have to try it. Definitely pick up a copy...everybody! Arlene...NO, it's not going to require a new shelf, LOL!! It's a soft cover...and only about an inch thick. Sold!? Stephanie...the pleasure was all mine! Your book was such a happy surprise...it will be much loved in my house. Mely...awwww, thanks so much! I try to write as if I'm talking w/ you, so I'm glad to hear that it comes through that way :) Feliz año Nuevo to you, as well! Loved your review, Heather. You've inspired me to check out this cook book. Your timing is perfect because one of my New Year's resolutions is to use my slow cooker more. It's such a great time saver. 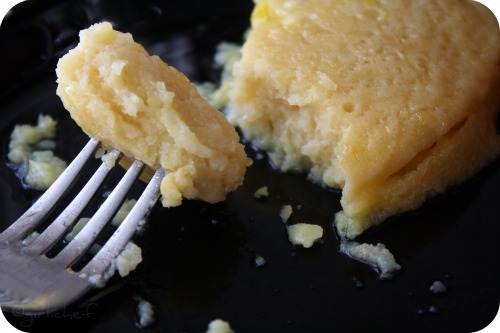 Steph's blog is my go-to when I'm looking for a slow cooker recipe. That girl is amazing! So funny! I just posted a " I don't feel like cookin" recipe for chicken tagging on my site. Tis the season I suppose! I love Stephanies sites it's actually the very first one I started following recommended by my sister. I will look for herebook immediately as I just got a new IPad! for her E book immediately as I just got a new IPad! Have a Great 2011 ! I am going to have to find that one because we have two slow cookers that never get used. 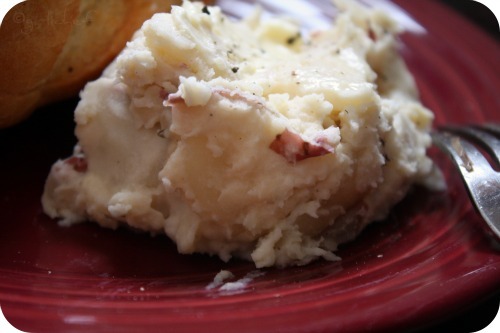 The mashed potato one especially caught my eye. I swear we are kitchen twins. Other than you're professionally trained and I'm not....anyway, I own two crockpot cookbooks that get lost in sea and I don't know why I don't use them more..and my crockpot. Rick, even on occasion, uses a crockpot. Great post as always Heather. Inspiration to take out the slow-cooker whoh has been hiding this winter. The aromas you describe make me want it all. Grand review! Happy New Year! May 2011 bring you and yours all good things! Yep, me too, black eyed's are ready along with the collards! A little twist on them though...hope you are doing well and stayin' warm girlie! Hand over that sammie and nobody gets hurt! Delicious! I rely on my slow cooker(s) at least once a week - they are such handy tools for busy or lazy days. I've been hooked on the slow cooker for...well, let's just say that I owned one of the very FIRST ones ever:) I have gone through MANY...still love them...always will. They make my life easier. Plus, we've found that we just like some things cooked that way much better. You don't EVEN want to know how many slow cooker cookbooks I own...they are there in the middle of the hundreds of others. Enough said! Come join me for Crock Pot Wednesdays whenever you can. I am in love with my slow cooker. This looks like an amazing book to get. Baking Taralli Pugliesi ...and a happy New Year!